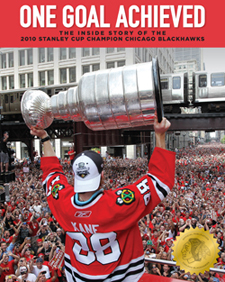 The following is an excerpt from One Goal Achieved: The Inside Story of the 2010 Stanley Cup Champion Chicago Blackhawks. Fans can purchase the book this holiday season at several locations, including Borders, Barnes and Noble, Jewel, Dominicks, Meijer, the Blackhawks Store (325 N. Michigan Ave and the United Center) and the Blackhawks Store Kiosk at Woodfield Mall or wherever books are sold. Shortly after being installed as president of the Blackhawks, John McDonough began gathering telephone numbers. During his front office reign with the Cubs, he was aware that several hockey players had left Chicago’s Original Six franchise in a bad way. These awkward or acrimonious departures tainted the team’s history and, by extension, affected fans who hurt for their bygone heroes and wondered why they were not part of the mix." Soon management announced that four Blackhawks Hall of Famers — Bobby Hull, Stan Mikita, Tony Esposito and later, Denis Savard — would serve as official “ambassadors,” performing a variety of duties, including personal appearances and autograph sessions, but most of all, helping to heal a fracture between the team and fans. McDonough’s initial gesture was toward Hull, who logged 15 glorious seasons with the Blackhawks before he jumped to the Winnipeg Jets of the World Hockey Association in 1972. “The Golden Jet” had been brought back for a couple of cameos in the Chicago Stadium and United Center, but, like Mikita, was not a visible presence. “Bobby and I were on the phone for about two hours, and most of the conversation was one-way, if you know what I mean,” said McDonough. “I put my listening skills to good use.” Hull also discussed his situation with Rocky Wirtz, the new team chairman, who confirmed McDonough’s doctrine. After briefly mulling the offer, Hull accepted. Hull and Mikita — who collected 604 and 541 goals respectively for the Blackhawks — were introduced as ambassadors at a United Center ceremony on March 7, 2008. A couple weeks later they were joined by Esposito, who played 15 seasons (1969-1984) in goal for the Blackhawks, winning a franchise record 418 victories. But he retired with little fanfare and assumed front office roles with the Pittsburgh Penguins and Tampa Bay Lightning. Savard, the fourth most prolific goal scorer (377) in Blackhawks annals, became the fourth ambassador in November of 2008. Since Wirtz and McDonough designated icons as ambassadors, other teams in Chicago have followed their lead. The Bulls named Scottie Pippen to a similar role; likewise the White Sox with Frank Thomas. Connecting with their legends had nothing to do with how the Blackhawks fared on the ice, but it had everything to do with altering the culture of the organization.